On February 12, secular organizations will be observing “Darwin Day” around the country. Observed on or around Charles Darwin’s birthday, February 12, Darwin Day celebrates the discoveries and life of Charles Darwin, the father of evolutionary theory. The political differences of opinion evident between Holt and Broun are reflected in the American public. Sixty-four percent of Democrats believe in evolution while 31% believe that humans have existed in present form since creation. Republicans are more divided: a plurality (48%) endorse the concept of creationism, while a similar percentage (45%) believe in evolution. Americans are also strongly divided on this issue along religious lines. Nearly two-thirds (65%) of white evangelical Christians like Rep. Broun, who is Southern Baptist, believe that humans have existed in present form since creation, while a similar percentage of white mainline Protestants (66%) such as Rep. Holt, who is a Quaker, believe in evolution. 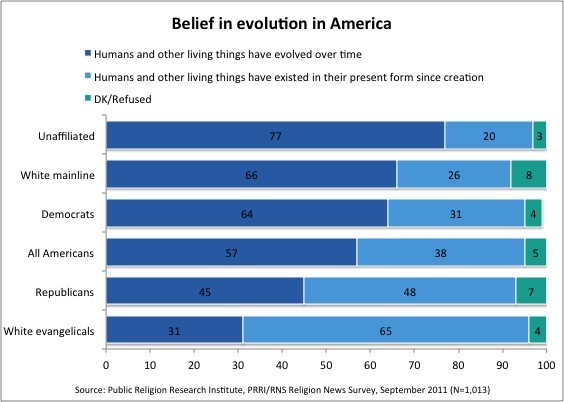 The religiously unaffiliated are most likely to believe in evolution (77%). Fittingly, the Darwin Day resolution was first introduced in a previous Congress by California Democrat Pete Stark, who was the only openly atheist member of Congress before he was unseated in the 2012 elections. Kyrsten Sinema, a Democrat from Arizona elected to the House in 2012, is the only openly religiously unaffiliated current member of Congress; she’s a co-signer of Holt’s Darwin Day declaration.